Hamilton Zoo’s new colt foal with his mum, Marble. A new striped arrival has boosted the zebra numbers at Hamilton Zoo to seven. The colt foal was born on the morning of January 21, to mum Marble and dad Bwana. 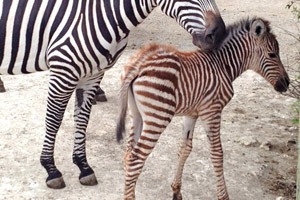 He is the first zebra to be born at the zoo since November 2011. He is the fourth foal for Marble, who is nine and was also born at Hamilton Zoo. He is the 11th foal by Bwana, who was born at Adelaide Zoo and imported to Hamilton in 2005. Of the seven zebras at the zoo, there are now three males and four females. Both mother and foal are doing well and Zookeeper Louise van der Sande is very excited about the new addition. There are around 20 zebras held in New Zealand. For now, the new arrival is yet to be named and is living in the zoo’s savannah enclosure along with the giraffes and antelopes.